I took last Sunday off in order to focus a bit more on my hybrid art journaling. But now I'm back and ready for the SPA theme this week. The theme this week is Italy and naturally with my background as an art student the first thing I thought of was the Italian Renaissance. And what is more Italy or Renaissance than Michelangelo's work at the Sistine Chapel? However the more I looked at the pointing finger of God, the more I thought of a referee at a game. In general in Renaissance art there's a lot of people pointing at something. Always drawing our attention to something more important than what we see at first. So it wasn't hard to find a "football player". Leonardo DaVinci's St. John the Baptist from ca. 1515 has some of that same arrogance we see in modern day's football players. 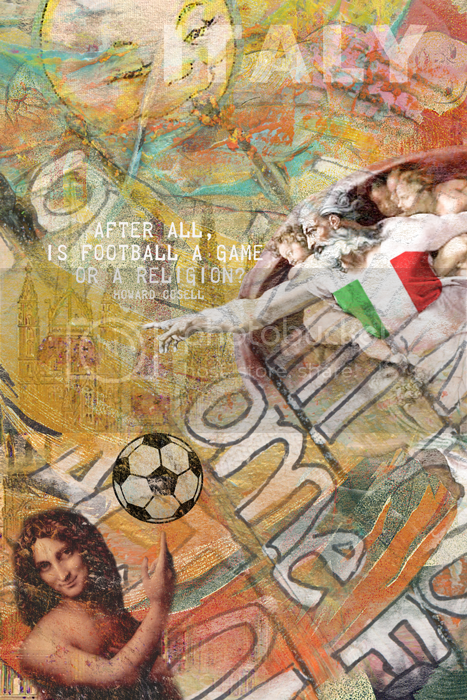 With these two paintings in mind I had to do something football related. I'm guessing I'm the only one who ended up thinking about football this week but I guess that's just the weird way my mind works. Have a great Sunday everyone. What a fabulous collage wonderful layering simply beautiful...great quote.